The Visual Resources Library supports the Art Department by providing images for classroom use, study and research. The collection encompasses art from the Prehistoric era to the present, plus a collection of historical images. The Library also provides some equipment for use by Art faculty and students. Other UCA faculty are also allowed some privileges. 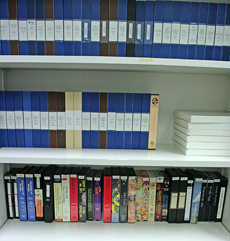 The Visual Resources Library currently houses digital and analog images, videos and DVDs, and some audio/visual equipment. The collection contains over 65,000 slides, 10,000 digital images, and over 175 DVDs and videos. Digital images are accessed through the MDID2 system. The library also lends digital projectors, laptops, iPads, speakers, carousels and mini-video cameras to Art Department faculty and students. Images obtained from the Visual Resources Collection are intended for educational use only. Due to copyrights, they are available only for the purpose of teaching or individual research. Art Faculty: Art Department faculty are required to reserve equipment and media in advance. A schedule for equipment is available in the VRL. 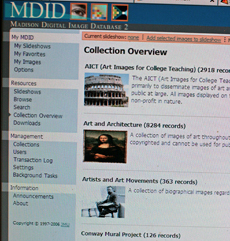 Digital images are stored on the MDID system, and is available online. A username and password can be obtained by contacting the curator. All new faculty are encouraged to scheduled an orientation of the VRL. Study pages for students can be set up on MDID. Please see curator for more information. Other Faculty: Faculty from other departments can request images and slides from the VRL. Please allow at least 2 weeks for orders to be filled. A form must be filed out at time of request. Equipment, with the exception of slide carousels, are for Art Department faculty only, and is not available for other departments. Students: Students are allowed to check out slides with an valid UCA ID for up to one week. Digital image requests are at the discretion of the curator and supervising faculty member. Equipment can only be checked out with a valid ID and prior permission from a supervising faculty member. Equipment must be returned within 24 hours, unless established beforehand. MDID – You must be a student currently enrolled in an art class that uses MDID in order to gain access. A username and password are required for entry. If you do not have one, or lost yours, contact your instructor. If you are a faculty member requiring access into MDID, then contact Sue Bennett (sbennett@uca.edu) for assistance. Use is limited to faculty and students at the University of Central Arkansas. Some of the images have been provided by commercial vendors with whom we have legal contracts specifically limiting access to faculty and student use at UCA. Other use may jeopardize future access to the images and incur legal action. The large images may not be transmitted elsewhere by any means. Students enrolled in certain art classes will receive a temporary login and password for access to study images for the current semester. Any abuse of the use of images will result in all privileges being suspended.